Keswick 1940. Britain is at war with Germany. Maggie’s life is under invasion too: Gran knitting for England, evacuees, lodgers, helping with the war effort – and now a fund raising concert party! Husband Rob is due home on RAF leave and best friend Peg has just learnt she’s pregnant – but no such luck for Maggie and Rob. 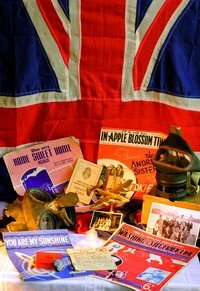 Nostalgia, romance, laughter and tears are part of this comedy full of live music, songs and dance from the war years.